If you just want to get a quick sample of what this stuff sounds like, use the player at right. If you want to download a whole track, use the links below. 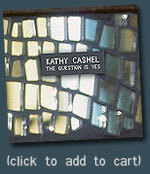 You can order copies of The Question is Yes (using PayPal) here. Sadly, The Rare Animal Zoo is completely sold out. I'm also at Exotic Fever Records and many fine independent music stores.